Coconut ribbon pakoda| seeval, i just saw this name in Krishna sweets during our trip to India in June. I didn't check out the packet to see the ingredients but noted down the name itself. I have already posted 2 version of ribbon pakoda in Jeyashri's kitchen. 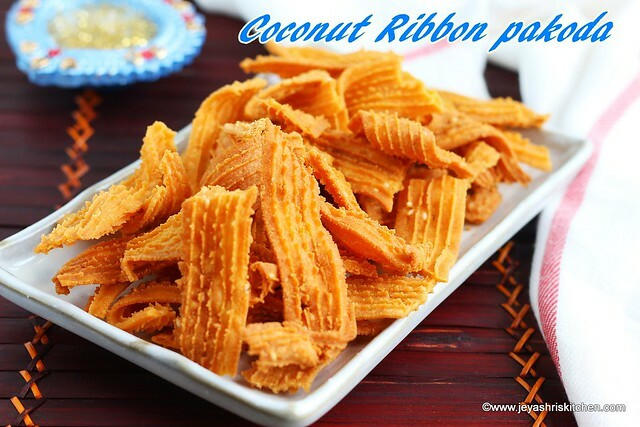 I tried this coconut ribbon pakoda at home by adding coconut milk, to make the dough. But some how i am not satisfied. Finally after 2-3 attempts, got the taste, which i had in my mind😃. I made this for my Cookery demo in Pasir ris CC, Singapore. Try this yummy, crispy coconut ribbon Pakoda. Check out my full collection of Deepavali Snack recipes | Diwali snack recipes. Grind the fresh coconut into a fine paste. You can add little water if needed. This gives a nice flavour to the coconut ribbon pakoda, so do not skip this. In a wide bowl add the rice flour,besan,coconut paste,red chili powder,salt, sesame seeds, butter and 1 tblsp hot oil. Warm the coconut milk. Do not boil, just make it warm. If you insert your fingers you should be able to keep the fingers in the coconut milk for 7 seconds. Adding warm coconut milk gives a nice texture to the ribbon pakoda. Add the coconut milk to this and knead this into a soft pliable dough. If needed add little water. Do not make it too stiff else it will be hard to squeeze. Cover the dough and take small portions and put into the murukku press using the ribbon pakoda achu. This time i used the achu which my mom gave to me. The achu has curves and so i got nice lines in the ribbon pakoda. Heat oil and when it becomes hot,bring the flame to medium. Squeeze dough into the oil. Fry in medium flame till the shh sound of the oil subsides. Drain in the kitchen towel. Home made coconut milk gives a very nice flavor to the ribbon pakoda. 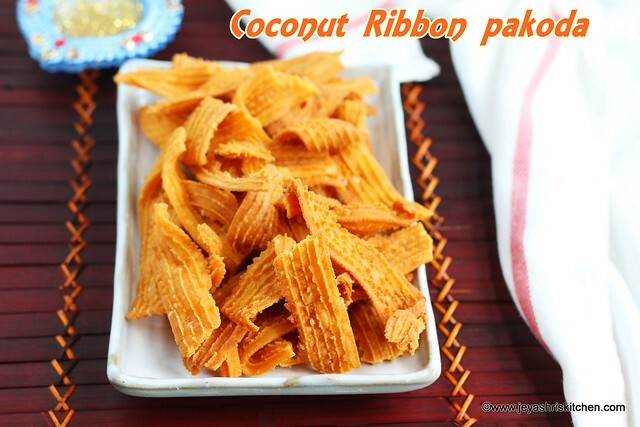 I tried this coconut ribbon pakoda with both store bought and home made coconut milk. Do not make the dough in bulk, make it in small portions. I made the dough for this 2 cups of flour (1 cup rice + 1 cup besan) in one go. Do not make more than that. Adding fresh coconut gives a nice taste and flavour, so do not skip this. This coconut ribbon pakoda stays crispy for 1 week. Store in an airtight container.